Before the UK’s 2016 referendum on membership of the EU, the IMF forecast that a vote to leave would be likely to lead to “sharp drops in equity and house prices, increased borrowing costs for households and businesses, and even a sudden stop of investment inflows into key sectors such as commercial real estate and finance”. After the vote for Brexit in June 2016, the UK economy seemed to have avoided the predicted real estate slowdown. According to the Nationwide Building Society’s House Price Index, annual UK house price growth was 4.5% in January 2017, slightly higher than the 4.4% annual house price inflation in January 2016 before the referendum. But in recent months, there appears to have been a more marked slowdown in the growth of house prices. The same Nationwide index now indicates that UK house prices grew by only 2% in year to September 2017, having dropped steadily since March 2017. More surprisingly, the usually buoyant London market is leading this recent trend of a cooling property market. The Economist (2017) discussed the relative slowdown across London price brackets. For the first time since 2005, London is the weakest performing region in the UK, with house prices having fallen by 0.6% in the third quarter of 2017 (July-September) and up only 1.2% on a year earlier. The East Midlands is the fastest growing region, with house price inflation of 5.1% in the third quarter. London, nonetheless, remains the most expensive region in the UK. The average house in London costs £471,761 compared with £177,825 in the East Midlands and £127,213 in the north of England. The most recent falls would need to accelerate and persist for many quarters to close these gaps. First, to help young people to purchase a home, the government abolished stamp duty for first-time buyers up to a house price value of £300,000. Specifically targeting the London market, if the property costs up to £500,000, then first-time buyers will pay no stamp duty on the first £300,000. Second, the Chancellor announced a £44 billion plan in the form of direct government investment, guarantees, and loans which, with planning reforms, aims to increase housing supply. First, we consider what respondents think is behind the recent developments considering, for example, potential roles for a delayed effect of Brexit and higher interest rates. Second, we ask about the likely effects on the UK economy of a continued cooling of the housing market. One view is that the slowdown in London house prices is a sign of likely future developments in the rest of the UK. Such a view stresses signs of cooling in the housing market. For example, mortgage approvals fell to 66,232 in September (a three-month low). Housing transactions decreased by 1.8% between August 2017 and September 2017. The September 2017 RICS survey’s main indicators on demand and sales ‘”both slipped deeper into negative territory, with this subdued picture anticipated to persist over the coming months”. The RICS survey results also suggest that London is the weakest of the UK regions but is certainly not alone in experiencing a slowing housing market. And to the extent that the Bank of England’s November increase in interest rates is the start of a gradual normalisation of interest rates, higher mortgage costs will contribute to lower demand in the whole country. On the other hand, some of these signs of housing market weakness are less pronounced than had been expected previously. For example, the September mortgage approvals outturn was slightly above the mean of a Reuters’ poll of economists. And the Bank of England’s November Inflation Report concluded on the housing market that “the outlook is more resilient than in August” (Bank of England 2017). There are also reasons for thinking that there are London-specific factors at work. For example, London may be more affected by Brexit concerns, was potentially already over-valued, and is more affected by higher stamp duty on second homes than other regions. 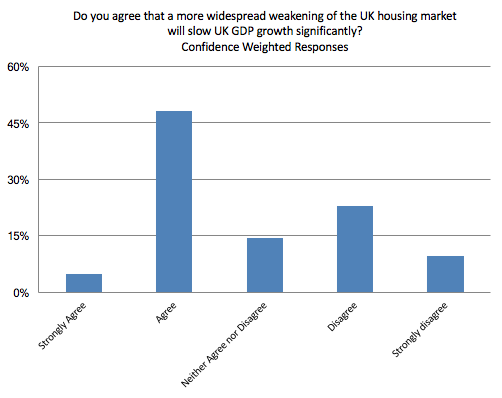 The first question in the CFM-CEPR survey asked for views about the current outlook for the UK housing market. Forty-four panel members answered this question. Overall, the panel members agree with the statement; 47% either agree or strongly agree (54% weighted by self-reported confidence); 23% either disagree or strongly disagree; and around 20% neither agree nor disagree. Sean Holly (University of Cambridge) strongly agrees and cites his own research (Holly et al. 2011) showing that “a ripple effect emanates from London, and in time spreads out to other regions”. Ethan Ilzetzki (London School of Economics, LSE) also cites his own research (Cloyne et al. 2017) to point out the channel of the likely spillover from a slowdown in London house prices. His results indicate that “a £1 decline in housing prices leads to a 20p decline in borrowing”, and that the decline in borrowing would weaken consumption demand by Londoners. This leads him to conclude that “house prices in the rest of the country are bound to suffer as well”. Ray Barrell (Brunel University) is one of a number of panel members who point to the combined effect of moderating demand and, potentially, expanding supply. “Housing supply might rise. Housing demand growth will moderate, in part because the reality of the costs of exiting the EU will begin to be felt.” He emphasises the effect of reduced EU migration on demand, and points out that this is likely to affect the regions around London but less so elsewhere. Sir Christopher Pissarides (LSE) agrees that the effects will be greatest in London but does “not see any reason why the rest of the country would be immune to that”. Strongly disagreeing, Patrick Minford (Cardiff University) points to “good signs of steady upward movement now outside London” and emphasises London-specific factors driving behaviour there. Richard Portes (London Business School) and David Smith (Sunday Times) both think that non-London regions will experience less growth rather than falls in prices. Martin Ellison (University of Oxford) explores the relationship using the Nationwide index. His analysis suggests that, if anything, house prices in the non-London regions are a better predictor of the behaviour of London house prices than vice versa. Acknowledging the importance of the Brexit outcome, he nonetheless notes that that “the -5.1% fall in London house prices seen in the immediate aftermath of Black Wednesday 1992Q4 failed to ripple out in any meaningful way”. A number of panel members feel that the uncertainty is too great at the moment (and possibly in general) to engage in predictions about what will happen. They neither agree nor disagree with the statement. This group includes Panicos Demetriades (University of Leicester), Morten Ravn (University College London, UCL) and Ricardo Reis (LSE). 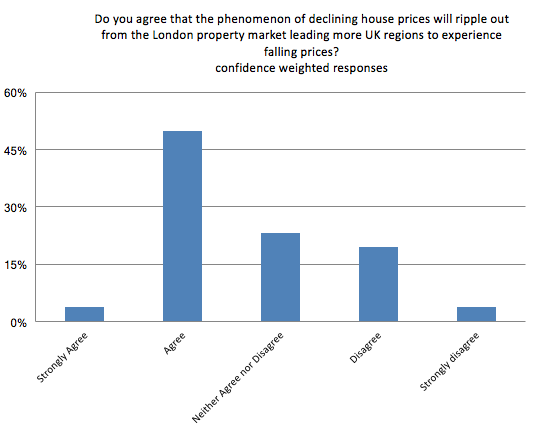 Some respondents see desirability in a fall in house prices. Dame Kate Barker (British Coal Staff Superannuation Scheme) actually sees falls in regional house prices as possible, but thinks that the declines in regions outside London would be driven by different factors than the ones affecting London house prices and hence it would not be a rippling out. Two panel members think the focus on house price growth is itself wrong. Andrew Mountford (Royal Holloway, University of London) points to “the damaging structural role that housing plays in the UK economy” through reduced social mobility, threats to financial stability and investment that is distorted toward housing. David Miles (Imperial College London) points out that small, often transitory, house price oscillations should not attract the attention they do. He notes that “newspapers get very excited by even the smallest fall and start writing about meltdown coming across the UK and then within a few months are writing stories about London being on fire again”. The Bank of England’s November 2017 Inflation Report states that: “Housing investment growth overall is projected to be fairly subdued in coming quarters” (Bank of England 2017). Historically, there is a high correlation in the UK between consumption growth and house price inflation. This suggests that weakness in the housing market is likely to reduce household consumption, as well as having a direct effect on investment. A weaker housing market may also exacerbate already weak productivity through increased mismatch. Households that are unable to sell a property may potentially be unable to switch employment and move to a better job match without a long commute. International evidence, however, suggests that the effects of house price depreciations are not so simple. For example, Mian et al. (2015) find asymmetric effects in the US of large and moderate house price depreciations. Aizenman et al. (2016) examine a panel of countries and find a positive effect of large house price depreciations on economic growth. As such, a significantly weaker UK housing market, especially when led by reductions in the price of property in London, may actually boost GDP growth. For example, Caballero et al. (2008) show that falling house prices may force low-productivity firms out of the market, which would further free up bank credit to lend to productive firms. And with less mortgage lending activity, credit may be reallocated toward the commercial and industrial sectors. More affordable housing may also make it easier for younger workers who are currently renting to move into areas with high-productivity jobs. Furthermore, a major house price correction may redistribute wealth toward the young, thereby helping to address intergenerational inequality. Forty-three panel members answered this question. 44% either agree or strongly agree (53% weighted by self-reported confidence), 35% (33%) either disagree or strongly disagree, and 19% (14%) that neither agree nor disagree. Costas Milas (University of Liverpool) notes that “both in 1990 and in 2008, a big drop in real house prices preceded recessions”. Some members point to a likely wealth effect. Roger Farmer (University of Warwick and the National Institute of Economic and Social Research) says that “housing wealth is over half of all UK wealth and, if house price growth falls or reverses, there will be a significant feedback effect on to measured growth”. John Muellbauer (Nuffield College, University of Oxford) emphasises the short-run negative consequences of house prices through weaker aggregate consumption given that the “collateral effect on spending in the UK of housing wealth and the buffer stock role of home equity, given easy refinancing of mortgages, is substantial”. But he also stresses some factors indicating that the home-equity channel is likely to be weaker than it was in the early 2000s: young people are increasingly unlikely to have a mortgage, higher proportions of mortgages are at fixed rates, mortgage credit is more restricted now and retirees are “fairly insensitive to variations in owner-occupied housing wealth”. Ray Barrell (Brunel University London) worries that “weak house prices may reduce entrepreneurial activity and business investment, as many small ventures are initially financed on the back of loans secured on residential property”. Ricardo Reis and Thorsten Beck (Cass Business School) point to the effects on the construction sector. Sylvester Eijffinger (CentER, Tilburg University) agrees with the statement and worries that the relationship will be stronger than typically because it is accompanied by the uncertainty surrounding the Brexit negotiations. Wouter den Haan (LSE) disagrees but also worries that, potentially, “combined with Brexit uncertainty, falling house prices may negatively affect confidence substantially and then effects could be bigger”. 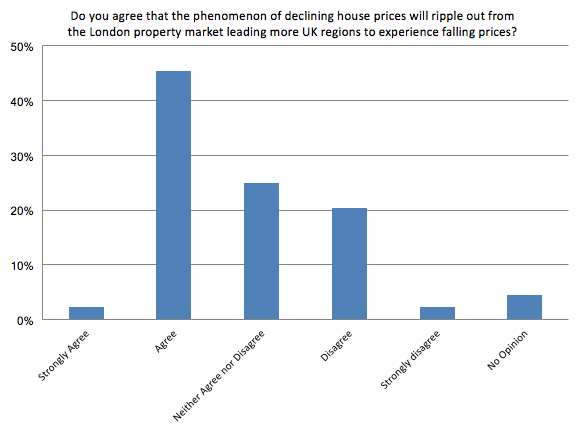 Many panel members point out problems of looking at correlations between economic activity and house prices. Jan Eeckhout (UCL) believes that “the causality from GDP growth to housing (and not in the other direction) seems dominant”. John Van Reenen (MIT Sloan) similarly argues that a Brexit-induced decline in real incomes will cause “both a fall in consumption and house prices (relative to trend)”. Michael Wickens (Cardiff Business School and University of York) additionally notes that an “attempt to increase the supply of housing would ‘weaken’ the housing market but would generate output and not slow output growth”. Disagreeing with the statement, some members think that the effects will be muted and so disagree with the statement’s use of “significantly”. 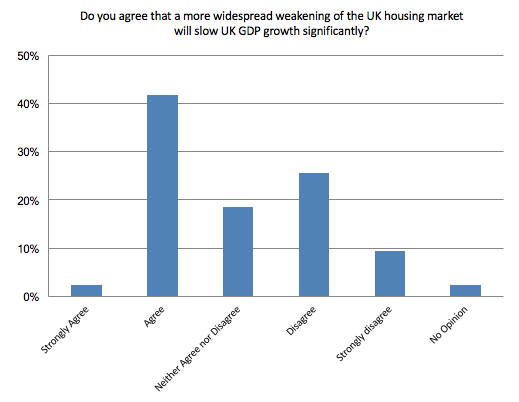 Richard Dennis (University of Glasgow) expects “weakness in the housing sector to damp GDP growth somewhat”. But he notes that “if house prices were to fall bringing about a steep decline in residential investment, then that would be a different story”. Some respondents – for example Andrew Mountford, Dame Kate Barker and Gianluca Benigno (LSE) – think that lower house prices would be a good thing for the UK economy and especially young people. John Muellbauer also emphasises how “a switch from taxation on transactions (stamp duty) to taxation of property values”, together with housing supply expansion, could “increase rates of family formation and reduce the outmigration of talented Brits seeking a better life outside the UK”. Aizenman, J, Y Jinjarak and H Zheng (2016), “Real estate valuations and economic growth: The cost of housing cycles”, VoxEU.org, 24 October. Bank of England (2017), Inflation Report, November 2017. Caballero, R J, T Hoshi and A K Kashyap (2008), “Zombie Lending and Depressed Restructuring in Japan”, American Economic Review 98(5): 1943-1977. Cloyne, J, K Huber, E Ilzetzki and H Kleven (2017), “The effect of house prices on household borrowing: a new approach”, Staff Working Paper No. 650, Bank of England. Economist (2017), “Why London’s house prices are falling”, 10 November. Holly, S, M Pesaran and T Yamagata (2011), “The spatial and temporal diffusion of house prices in the UK”, Journal of Urban Economics 69(1): 2-23. Mian, A, A Sufi and F Trebbi (2015), “Foreclosures, House Prices, and the Real Economy”, The Journal of Finance 70(6): 2587-2634.